Do you find yourself wondering what you can do about the scary-sounding environmental challenges of our time? Do you wish you could do something to make a difference, but doubt you have the time, energy, money, or power? 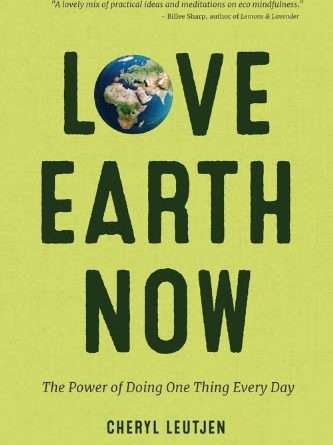 “Love Earth Now: The Power of Doing One Thing Every Day” is a new book whose author, Cheryl Leutjen, puts forth her suggestions on how to combine environmentalism and use spirituality to attain a state of eco-mindfulness and sustainable living. She calls it a “wise book of planetary self-help” and it’s a deeply thoughtful and often comedic exploration of her own efforts to make an eco-contribution. Through personal observation, Leutjen’s ode to our planet ends each chapter with a planet-positive “Love Earth Invitation,” a simple and immediate exercise that prompts you to explore your own feelings and calls you to action. 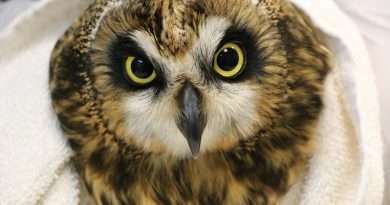 She hopes these eco-mindfulness moments provide the opportunity to reflect and discover what you can do right now to contribute to a sustainable future for us all. I ordered it, thinking it was a practical guide for daily life: how to make your own detergent, how to recycle rainwater, suggestions on how to create less trash. I didn’t realize it was a spiritual journey to changing your thinking about Mother Earth from a more mindful perspective. Leutjen does speak about practical matters like good reasons to start a compost pile, citing a disturbing piece of research that drives home the point to readers: Los Angeles collects on average more than six tons per day of refuse, recyclables, and yard waste. She makes you think about that number, multiplied by all the cities across the world. What she mostly does, though, is reframe life from a very spiritual perspective, making the reader appreciate simple things like the usefulness of pigeons, the beauty of compassion, and even the sacredness of the usually-unappreciated ant. In chapter two, she shares an anecdote about how she found a hurt pigeon, which ended up being too sick to survive. Still, her brief encounter gave her pause to marvel at the mysterious homing instinct of the bird, which in turn helped her think about how she “finds home” in her soul. 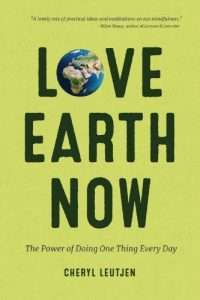 I have to admit, not every chapter resonates with me (I can’t get on board with thanking ants for their role in the ecosystem when they’re marching through my house – though yes, yes, I know they’re important), but I appreciate her overall thrust to make people stop and think about Earth and how we’re taking care of it- and what we can do better. I also believe we’re all one, all connected – so taking care of the planet is really just like taking care of ourselves.